I have always been a fan of the latest and greatest and for me, browser use is no exception. When Firefox was launched I quickly made the switch to get away from the (to this day) archaic Internet Explorer. Eventually when Google launched Chrome I quickly proceeded to give it a shot as well. 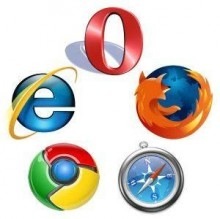 The following are some of the benefits I have found using multiple browsers. The web is forever changing, and quickly at that. It seems that each week I encounter a website that does not display properly in one browser or another. The only sure-fire way to ensure you are able to view websites properly is to have multiple browsers. Chances are if you are using IE many sites are being displayed incorrectly and you may not even know about it. Chrome and Firefox work better universally but each still encounters problems from time to time. Browsers differ in the way they display pages because each chooses to innovate at different speeds to accommodate new web practices. IE, for example, has long been a laggard in following accepted CSS practices (the code that determines a websites presentation) and rendering them correctly. Having multiple browsers means you can keep multiple copies of data stored within each browser such as bookmarks. This can be extremely helpful. Google recently released a new version of Chrome that makes it very easy for users (including techies like myself) to delete all of their bookmarks and settings. Needless to say I accidentally deleted my profile trying to remove the new obscene cupcake in the browser. You heard me right, see this article for more info. Thankfully I use Firefox extensively as well and was able to import all of my data from Firefox to restore Chrome. I feel sorry for those who did the same thing but don’t use a second browser. Finally, each browser has their own unique benefits and drawbacks. Chrome is, understandably, the fastest browser for searching Google. With Chrome, users have been able to make search queries right from their address bar and Firefox only recently implemented this to catch up. Each browser also has its advantages with specific apps or webpages. I find Firefox to be much more efficient with Feedly, an app that I use for consolidating all my news sources. Some may be concerned with maintaining bookmarks across browsers but this can be accomplished fairly easily. You can simply perform manual imports/exports to ensure your bookmarks are up to date or set up automatic syncing. The biggest issue I find with using multiple browsers is that I like to keep passwords stored for the sites that I use and find it annoying to try and log in and find out that a password is out of date and have to try and figure out what it could be. To solve this problem, I try to use my browsers evenly and keep them up to date. If you are a Chrome or Firefox fanboy, hop over the fence and give the other browser a try. Familiarizing yourself with each browser can yield substantial benefits. Just, whatever you do, do not use Internet Explorer. What browsers do you use and why? Next postWill Google Acquire RIM? Thank you very much for the info. it was extremely informative!